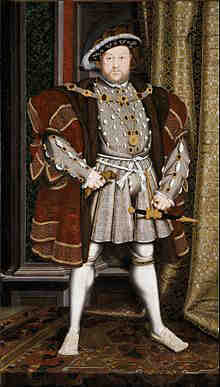 Henry VIII (28 June 1491 \endash 28 January 1547) was King of England from 21 April 1509 until his death. He was Lord Lordship_of_Ireland, and later assumed the Kingship King_of_Ireland, of Ireland, as well as continuing the nominal claim English_claims_to_the_French_throne by the English monarchs to the Kingdom of France. Henry was the second monarch of the Tudor dynasty succeeding his father, Henry VII of_England. In 1513, the new king allied with the Holy Roman Emperor, Maximillian I Maximilian_I,Holy_Roman_Emperor, and invaded France with a large, well-equipped army, but achieved little at a considerable financial cost. Maximillian, for his part, used the English invasion to his own ends, and this prejudiced England's ability to defeat the French. This foray would prove the start of an obsession for Henry, who invaded again in 1544. This time, Henry's forces captured the important city of Boulogne , but again the Holy Roman Emperor, Charles V Holy_Roman_Emperor, supported Henry only as long as he needed to and England, strained by the enormous cost of the war, ransomed the city back for peace.